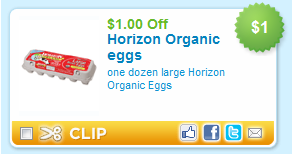 Tonight I am seeing a $1/1 Horizon Organic Eggs printable coupon. You can also print a $0.75/1 Land O Lakes Eggs Coupon. The $0.55/2 Eggs (any dozen) coupon is still available here as well! Not sure why all of the eggs coupons, but print these while you can if you think you’ll use them!